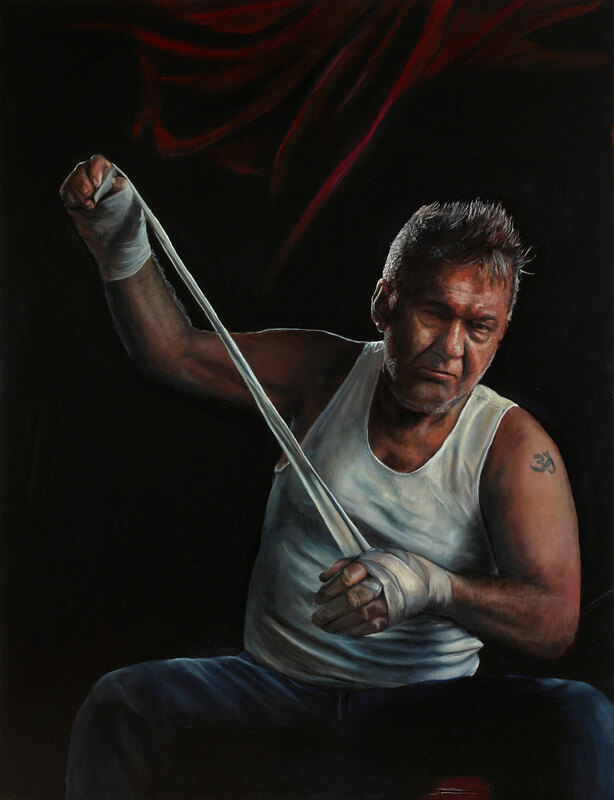 Jamie Preisz’s subject is rock star Jimmy Barnes, who has a massive following both as the lead singer of Cold Chisel and as a solo performer. His two memoirs – Working class boy (2016) and Working class man (2017) – are both bestsellers. ‘Jimmy has never been afraid to stand up and fight; he’s fought for his career, his family and even his life,’ says Preisz. ‘His dad, Jim Swan, was a prize-fighter in Glasgow and that formed part of my inspiration to depict him as a boxer. After losing my sister to suicide, I was touched deeply when I saw an interview with Jimmy speaking about his own suicide attempt. To me, he was fighting against the stigma of mental health issues by speaking so publicly about his own struggles, especially to generations of men who don’t feel that having emotional intelligence is a masculine quality. Born in 1990 in Sydney, where he still lives and works, Preisz studied at the College of Fine Art. This is his first time in the Archibald Prize.